Twickenham Stadium’s new East Stand development officially opened on Saturday 3rd November in time for the Quilter Internationals matches. Trivandi have been part of the RFU team since March 2018 to oversee the operational readiness for the new East Stand. Chris Conneally has been leading for Trivandi on the development and integration of the RFU functional area operating plans, designing and running readiness exercises and coordinating a programme of test events prior to the official opening. The East Stand extension is the first significant redevelopment of Twickenham Stadium since the South Stand was completed in 2008. It provides 11,000sqm of on-site facilities for 6,800 guests across seven unique world-class venues. The development now brings all official hospitality and debenture lounge access within the stadium and significantly enhances the match-day experience. 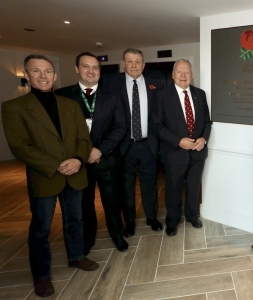 The new East Stand was officially opened by former England Rugby captain and World Rugby Chairman, Bill Beaumont CBE. RFU’s Venue Director, Mark Lynch said “we brought Trivandi into the RFU team because of their combined experience of venue construction and operations. They have done an outstanding job of leading our team through the different stages of operational planning, readiness and testing”.